There are lots of ways in which one can look to the Sight and Sound film list for inspiration, and many ways to mine it for statistical gems. I decided to tally up the films by director, in order to see which were the most popular. Bear in mind that this means "most popular" to the 800-some critics the BFI polled. This may or may not be a representative cross-section of film-goers. Some directors don't stand a chance by this measure. Jean Vigo barely lived through his second feature, but everything he shot is vital. Dziga Vertov made mostly documentaries and shorts, so his films are rarely seen and likely wouldn't fit the criteria for this list. Ditto Chris Marker. Víctor Erice has only one feature available for English-speakers, but Secrets of the Beehive is essential viewing! So, no, quantity does not equate to quality. Nonetheless, the results are quite surprising. Here is the tally of those directors who got on the list more than once, working up to the unchallenged victor (by this metric, anyway). Along the way I'll throw in some of my personal opinions, since that's what makes it fun. Given the enormous French bias, I was rather surprised to see Truffaut and Resnais only placed twice. It is a bit scandalous that Nuit et Brouillard is missing... a landmark film and powerful even now. I could never narrow Wim Wenders down to two features. And to discover that Wings of Desire didn't make the list is something of a travesty. Kieslowski would be near the top of any list I'd compile, what with Dekalog, Blue/White/Red, Double Vie, and others. I would also bump up Lynch through inclusion of Lost Highway and Inland Empire. But I am even more surprised at the fact Kurosawa placed only three films, given that it's film critics who were polled. Once again there are some curious omissions even from directors that are well-represented. Tarkovsky's The Sacrifice and Ivan's Childhood are major works; the former arguably more intriguing than the (late period) Bergman to which it obviously pays homage. Welles' The Trial, The Lady from Shanghai, and Macbeth are missing but Chimes At Midnight is included? I suppose I should check that out again. I never got the deal with Renoir, but will have to give him another try. And sorry Rossellini, the neorealist thing never floated my boat. (I was trying to think of an idiom involving bicycles, but...) On the other hand Fellini deserves his four places; even if he is not a personal favourite, his importance in the world of film is undeniable. But La Dolce Vita is certainly more radical in structure and world-view than the egocentric 8 1/2. OK, I admit it, I have never watched a Dreyer film. Sorry Carl, I will fix that soon. Antonioni seems to me not to have aged well, and aren't all of the movies exactly the same, anyway? Basically: bored rich people wander around. In the nicest possible way, of course. Kubrick, though... you could put all his films on the list and I wouldn't complain. Certainly "The Killing" seems under-rated. 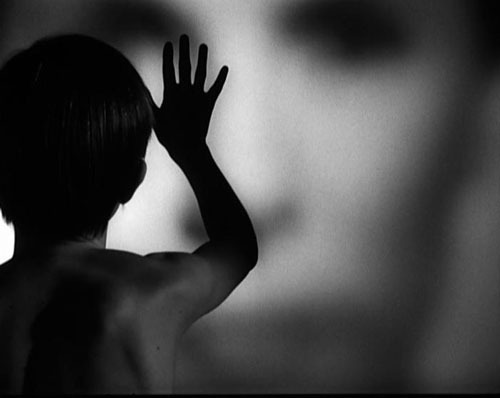 I might debate some of the Bergman choices, but he made so many films and I've seen far from all of them. I find Wild Strawberries dull while The Silence (missing in action on this list) is insanely good. No matter: I cannot disagree with placing Persona head and shoulders above the rest. Hitchcock, well, who doesn't love Hitch? But Notorious and even North By Northwest are not great choices when The Birds and Marnie are not yet included. I mean, The Birds practically invented a horror sub-genre. Here's where I scratch my head and say... well it is the British Film Institute. Obviously they asked a lot of British critics or how can there be six entries from Michael Powell/Emeric Pressburger. And yes, I forgive you for not even knowing who they are. Howard Hawks also seems to have far too many entries. I understand Buñuel, since I had a bit of a fixation on his particular oddness back in the eighties. He is one of the few true film surrealists and the only one to have any degree of success. And it wouldn't be a cinephile list if Godard wasn't over-represented. Again, I wouldn't be surprised if you'd never seen a Bresson film. If that's the case, let me give you a word of advice. Skip the highest ranked title in the Sight and Sound poll. Au hasard Balthazar is dark and dreary, unless you happen to be particularly interested in donkey abuse. Mouchette is similar, but this time it's a human female taking the brunt of oppression. Sound like fun? Well, it seems to be the template for the career of Lars von Trier, at least. On the other hand, Pickpocket is note perfect. Slow, subtle, and repetitive, I was nonetheless entranced the entire time. It contains flash after flash of pure film-making genius, something I really couldn't find in the aforementioned titles (even though I was positively disposed to like them). So, I've spent three posts now on one particular list of films. I suppose this is a measure of my love for cinema. And the Sight and Sound listing happens only once a decade. I for one am content to acknowledge it as canonical, and then treat this status with appropriate scepticism. Regardless of how much we agree or disagree with this ranking, I think we can use it in a practical way: as a film planner. I know I have the next months of film viewing sorted! Thank you for going through the trouble to put this list together (and to unveil its truths and biases). This list as you organized it is EXACTLY what I was looking for. What would be your list of top ten directors? I am not sure I could even do that. The whole idea of ranking makes little sense given the complexities inherent in everyday life.